I promised a more detailed update so here it is! (I would like to apologize in advance for any spelling/grammar mistakes you find. I am tired and it is very, very late). First I’ll just show our daily schedule and then I’ll do a quick documentation of every day that I have been in Russia so far! Our daily schedule is for the most part identical every day. To help you understand this post I should inform all of the that energizers are morning activities that the volunteers organize to help wake up in the mornings. They range from Russian dances, non russian dances, songs, and other things to get the blood flowing. They are much needed since everyone seems dead in the mornings. Now I’ll go through a quick overview telling what I’ve done for the past week. This was the first day of Russian classes and it was very fun and intimidating at the same time. 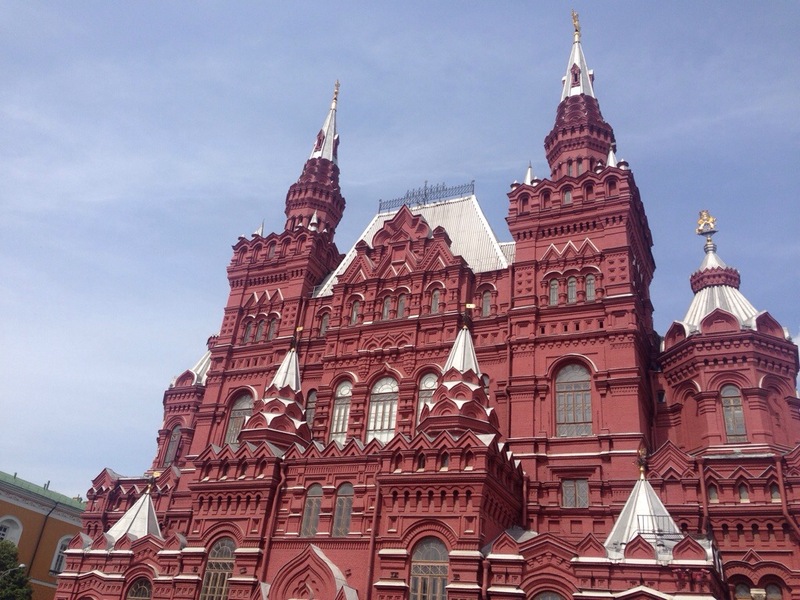 I had had no prior experience with the Russian so although I was excited, I was very nervous at the same time. The classes went by very quickly and I thoroughly enjoyed them. At the beginning of our classes we were told that we had to prepare a slideshow presentation in Russian to present to our host families we were going to meet that Wednesday. No one knew we would have to do this so it was a bit of a shock, but if anything it just helped our with our Russian. Russian is such an interesting language and while it is very difficult, it is fun challenge. After classes we went to lunch and from there we took a bus tour of Kirov. Throughout this tour we went to the newer parts of the city and walked around at certain stops. 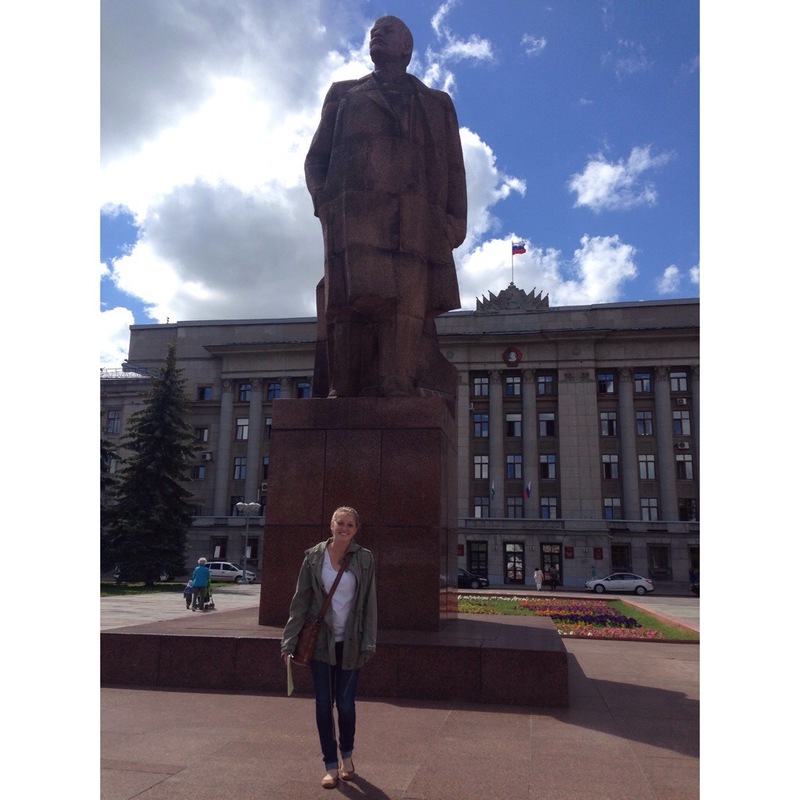 We saw the city square, the beautiful park located in the heart of the city (one of the 1000 parks in Kirov), as well as a Stalin statue. The parks in Kirov are very interesting. They are not only beautiful and full of greenery, but they have special places in them designated for little children. For example, at all the parks I’ve been to, little kids can rent out little barbie jeeps or small scooters to ride around, or there are little rides to go on, and these parks always have bounce houses!! After the tour everyone was exhausted and we went back to the classroom (which is on the first floor at the hostel) for an LC meeting and history lesson. An LC meeting is basically just where we talk about our days and what we liked and disliked. During the history lesson we just learn some fun history facts about Kirov. After that everyone stayed up pretty late finishing homework and working on the presentations until bedtime. On this day the first half of the day was nearly identical to Monday’s except for the fact that we learned a lot of different phrases and vocab to include in our presentations. After classes was lunch, and after lunch we had a walking tour around the older city of Kirov. 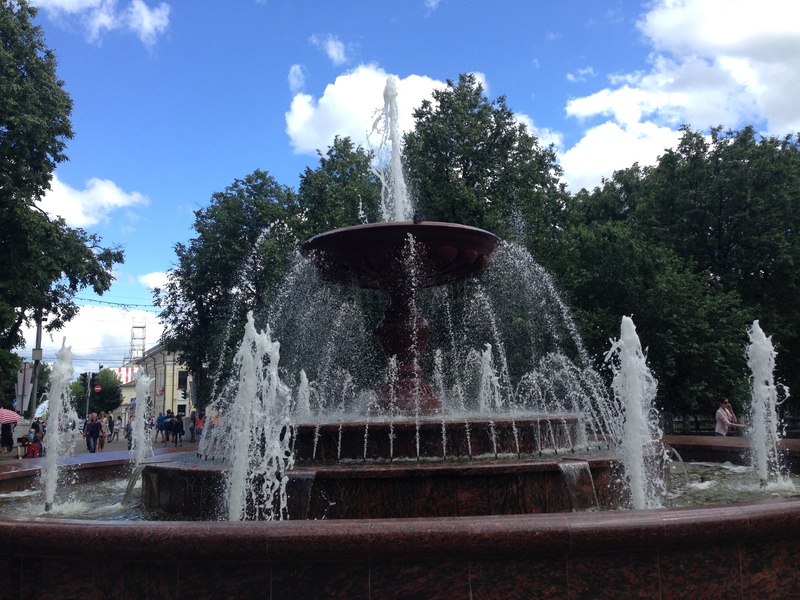 It was very nice and we walked through more parks and walked along the Vyatka river which was a very pretty sight. 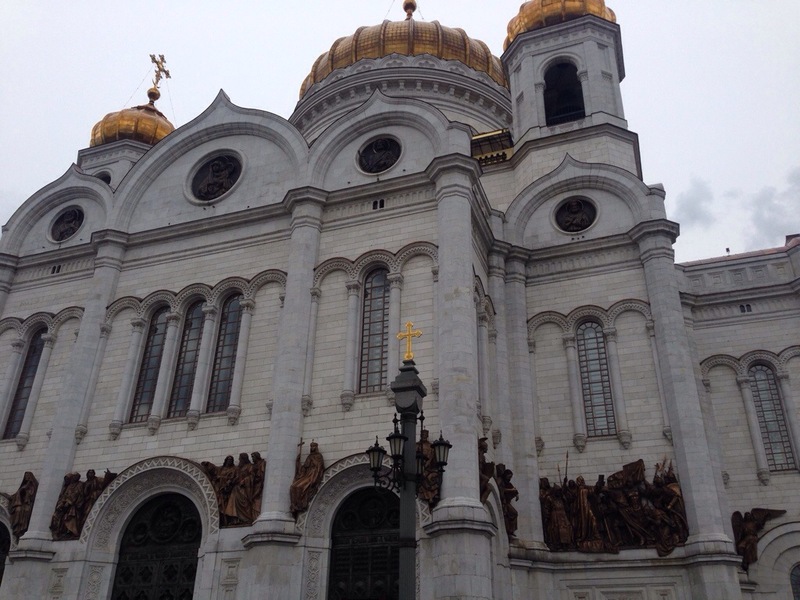 During this tour we saw a beautiful Cathedral in a cute secluded area of Kirov and it was breathtaking. Unfortunately, it started pouring down rain so we spent some time taking refuge under a breezeway. After the excursion the afternoon followed the schedule exactly except for the fact that everyone was frantic over their presentations and spent countless hours working on them. We all went to bed way too late that night. On Wednesday classes weren’t too hard. In Larissa’s class we really emphasized speaking and crucial vocal to use in our presentations we were to give that day. After lunch we had about two hours until our host families showed up at 3:00 pm for our presentations. Everyone was running around adding last minute changes and trying to fix grammar mistakes, all while setting up for our guests. At about 2:45 isn host families started filing in and finding their designated American student. My host mom and sister came and they were very kind to me. They looked over my notecards and helped me with some last minute pronunciation questions I had before I had to present in front of everyone. My presentation went better than I expected and I felt a lot more confident about speaking Russian after it. After the presentations we had an hour or so to spend time with our host families and do what we wanted. My host mom and sister took me on a walk around the city and we went to a nearby park. I couldn’t meet the rest of the family that day but I’m really looking forward to it! Once the families took us all back to the hostel, it was time for dinner, homework, and finally bedtime. Thursday was the day that our Russian peers came! 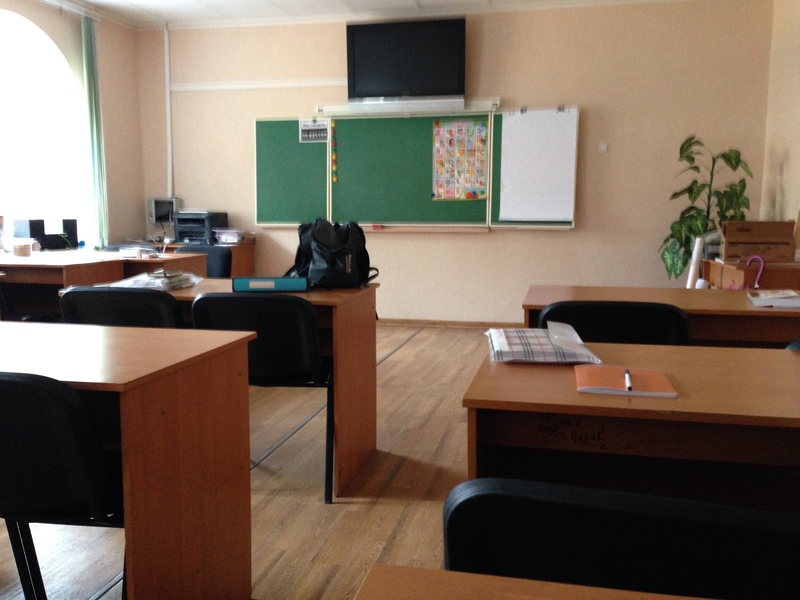 About 20 Russian students came from various parts of Russia to study English in Kirov. They live on the floor below us and are all super nice. On this day, after the usual classes and lunch, we played a plethora of games with them and started getting to know them. 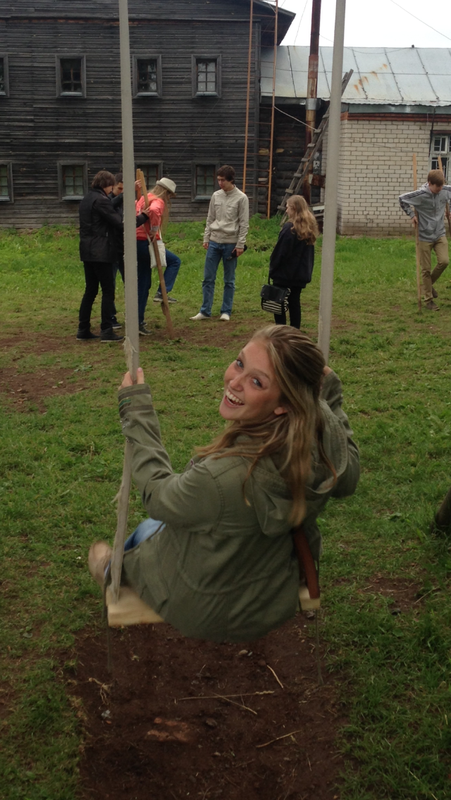 We danced a little, practiced Russian with them, and took part in some cultural activities with them. After these activities we went to dinner as usual. Then, after dinner we had study hall and the Russian student helped us with our homework which was extremely helpful. Their help is much appreciated! Classes progressively started getting more and more difficult. Everyone was excited for the weekend and a slight break on the intense classes we’d had all week. This afternoon the Americans all had to practice activities and performances to do for a summer camp we were going to on Sunday. It took a lot of time and we rehearsed until night time. We also had a brief study hall but otherwise it was a very relaxing day. On Saturday we had an extra hour of sleep which everyone was very excited about! However I think everyone would have been grateful if we got even more sleep. 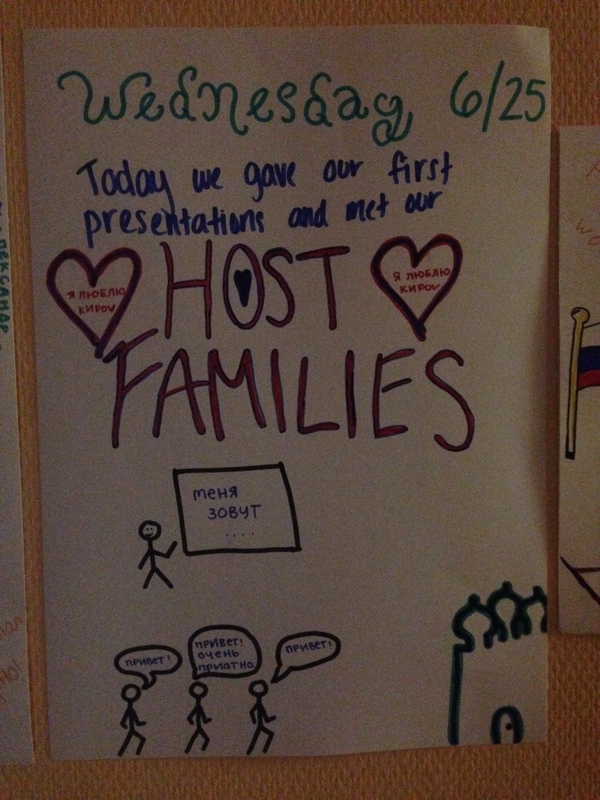 Anyways, the Russian students planned three cultural activity stations for the morning and they were all very fun. For one of the stations we had to try and complete a timeline of Russian history with pictures of famous people and different events in Russian history. It was very difficult and really made me realize how little I knew about Russian history (as well as the other americans I’m sure). The other two stations were making clay figures and Matryoshka dolls. It was very fun. 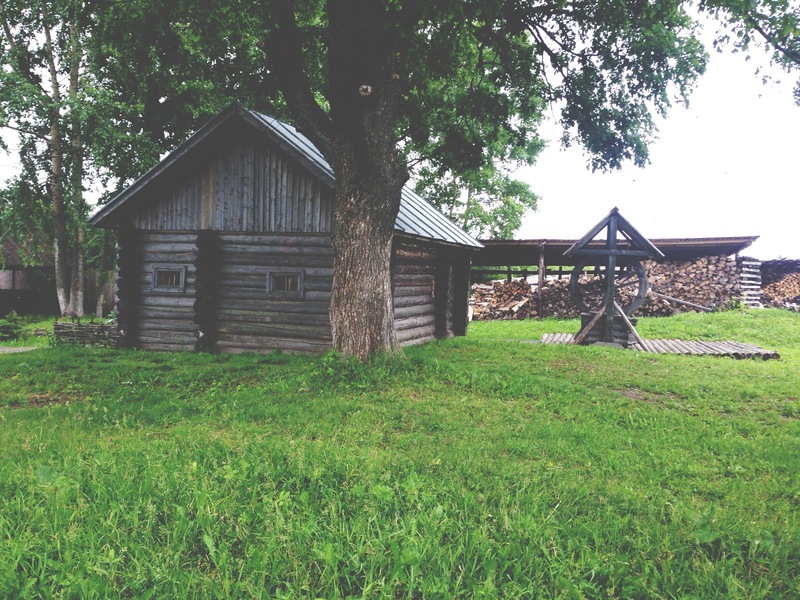 In the afternoon we traveled to a in house museum in the small town of Слободской and it was beautiful It was in the country side and everything was beautiful. For the first hour or so we toured the museum which was very interactive and very enjoyable. The museum highlighted an old time peasant home as well as the home of a famous Russian surgeon who performed many experiments. After the tour, our volunteers organized a small tea party for us and we played lots of games outside. We played tug of war, a play/fight/balance game on a lot, we walked on stilts, and just played around. 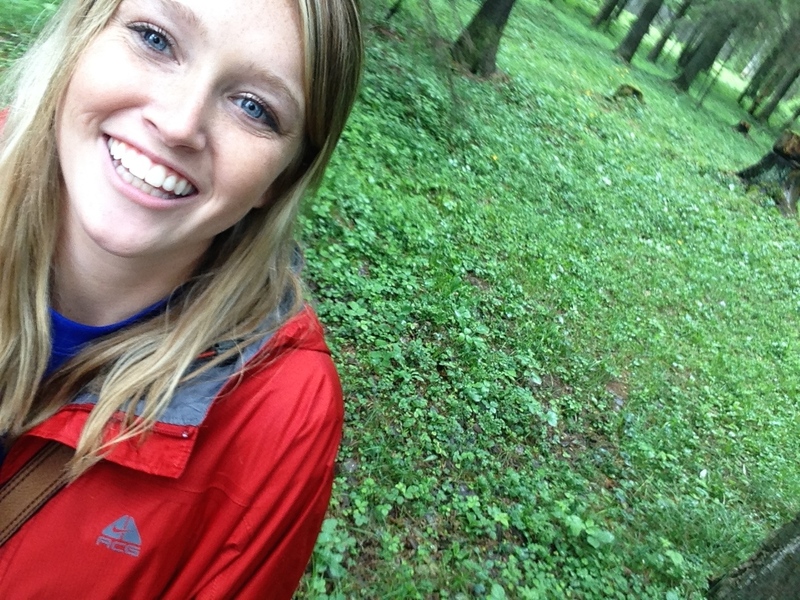 It was by far the best day I’ve had in Russia so far. 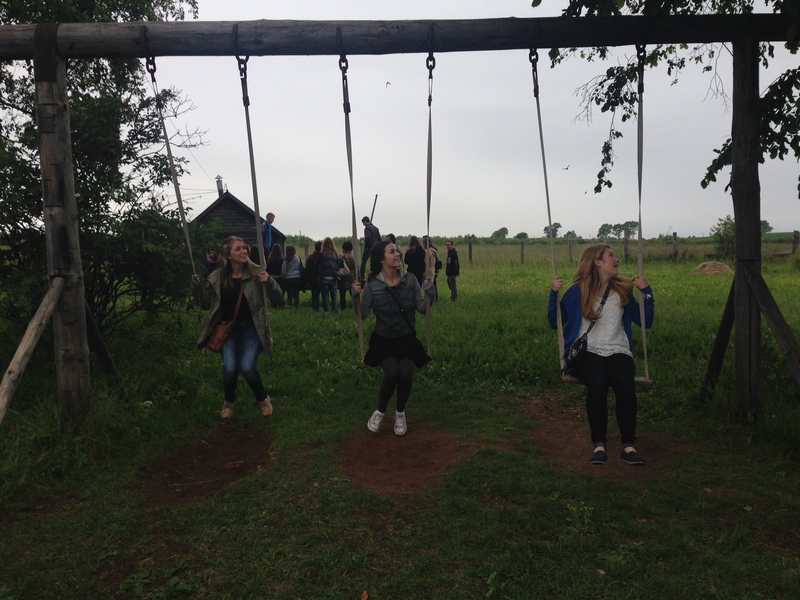 This day was very very fun! We got up fairly early and headed off to a summer camp for children outside of Kirov. We arrived at the camp and the children at the camp greeted us with many performances outside in a quad ranging from singing songs and dancing. They were very welcoming and nice. The weather was very poor so following their outside introduction everyone filed inside and we all watched a couple Russian performances. Some little girls did a very cute dance, some older campers danced to “What Does the Fox Say”, a girl sang a very beautiful Russian song, and a couple danced an amazing partner dance! I could tell the girl was a ballerina. Once their performances were over it was time for the performances we prepared. To start off, we all sang the national anthem which was entertaining because none of us are singers except one girl so it was a struggle! Then we taught the little kids “I’m a Little Teapot”, “The Itsy Bitsy Spider”, Cotton Eyed Joe, Cha Cha Slide, and four girls including myself performed the Cup Song from Pitch Perfect. My friend Margaux sang the song while the rest of us did the cups. We were lucky to have Margaux because she is a BEAUTIFUL singer! The song went well except for the fact that our cups were too light and bounced around a lot on the table. After that our Russian peers and us went into a room and played guitar and sang songs together. It was a good bonding experience! Next we all had lunch that was prepared for us by the restaurant that we eat at every day for every meal…the one and only Cafe Milk. They packed ouches for our excursion. Then we did some energizers with the older Russian campers and these were very interesting and fun. We then went and had a little tea party with our Russian peers that stay at the hostel with us. It was very nice and felt great since it was so cold outside. Finally, it was time to play games with the little kids. My friend Nick and I were assigned to kids between the ages of 7-9. THEY WERE SOOOO CUTE. They were so eager to meet Americans and hung on us and wanted to talk to us and they gave us many gifts (mainly food and candy). We get to go there again this Sunday and I’m very excited to go see all the kids again! The weather is supposed to be better and not so rainy so that will make it a lot more fun for outside activities. Love and miss you so much and I’m looking forward to seeing you when I return and going on more lunch/dinner/breakfast dates than we thought was possible! Week Number 2 at the Hostel! 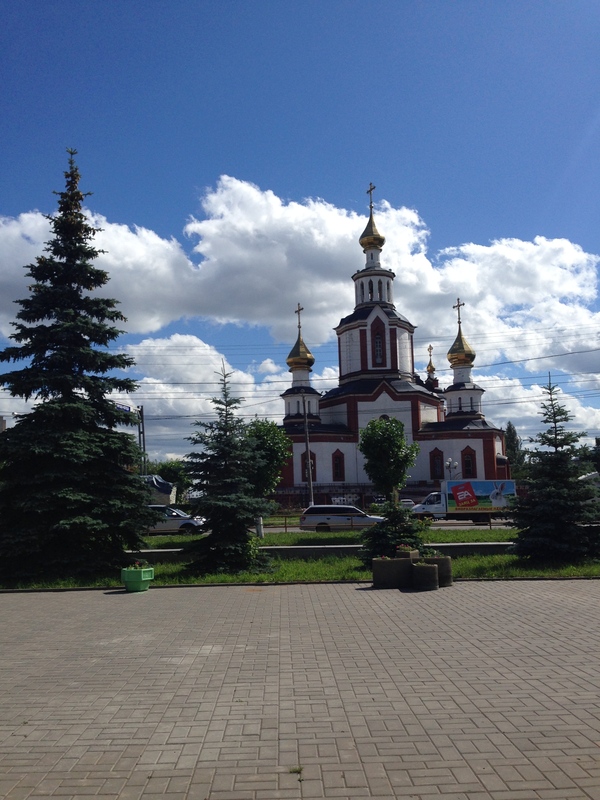 Previous Post Update from Kirov! Next Post Week Number 2 at the Hostel!